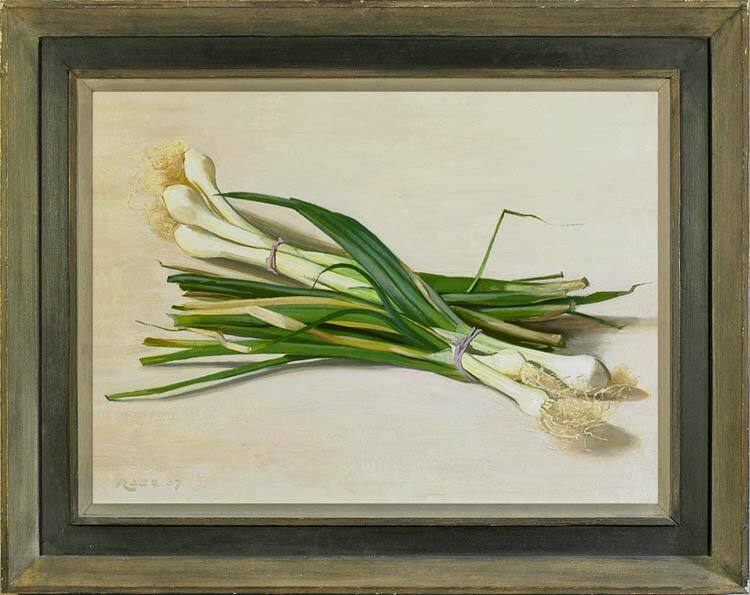 In another characteristically closely-observed study, Stephen Rose raises the most humble of subjects – bunched spring onions – to the level of a 17th century Dutch still life. The depiction of vegetable life on the cusp of decay, the outer leaves bent and browning, has the same allegorical thrust as a the moths and dying leaves in a flowerpiece by Rachel Ruysch (1664-1750). The viewpoint shuts out any boundaries to the surface on which the onions lie, but they are so fully realized, and the cast shadows and reflected lights so beautifully judged, that they appear to be firmly sited in a real three-dimensional space. The elastic bands are painted as carefully as the ribbon in a Dutch still life, giving by this reference an historical resonance to a contemporary re-making of the genre.